The current scenario here is such that if I walk around for say half an hour on foot from one place to another, I can easily peep into a dozen odd pandals set up for Lord Ganesha in the various adjoining localities. The place I'm talking about is Mumbai - the place that celebrates the Ganesh Chaturthi festival with the most enthusiastic fervor in all of India, the place that gives you a chance to shed all your inhibitions and meet the Lord one on one, the same place where I have lived all my life. Thus, this is something that I love to do, to visit some pandals in my neighborhood, pay my respects and ask for His blessings, year after year. My mom tells me, The ‘Lord of knowledge and wisdom’, ‘The Remover of obstacles’ can hear our words provided they are wrapped in folds of devotion, distance no bar. So, keep aside all your work for a few moments and and join me as I hop into some of the Mumbai Pandals in my neighborhood! Let's meet our very own friendly neighborhood Ganesha! While I see Him all the year around in temples and at home but meeting Him in pandals, is something different - its more personal... something that can be felt once you are there. Definitely cant be said for all, but the atmosphere in some of these pandals is really peaceful. "Ask Him for knowledge and wisdom, Beta." "But why not give him all my worries, Ma?" all your worries will automatically vanish away"
Hey Arti, I guess I'm first time here. I went to Baroda (Gujarat) recently and they've these huge celebration of Ganesha with hundreds and thousands of Ganesh Idols all around the city. They've one very beautiful in king's palace. Seems we share one common passion - spiritual travelling. Such lovely pandels Arti - I can see that they create an atmosphere of intimacy and devotion. Your Mother is a very wise woman! PS I attempted to comment on your former post last night but was unable. I really enjoyed the photos. I love your colorful post for the day, Arti!! I loved meeting all of your Ganeshas!! Hope you're having a great week! So lovely Arti! Yay Ganeshal ,ove and blessings! Very unique and interesting. They are quite different from ours. Oh wow..that's so colorful, interesting and fascinating to see! And very decorative too..I thought your mom's answer is very wise, and makes so much sense. Thanks for sharing this post, and was great to find out more about, meeting Ganesha. Such great advice with the conversation between you and your Mother: of having the gift of knowledge and wisdom, worries will vanish away. I enjoyed this Arti. Nice to experience the positive aspects of your culture with your blog. Ganesha look happy with a lot of flower and nice pandals. I can see the smile on his face. Beautiful captures! Loved the conversation between you and your mother. So true! Incredibly fascinating & colourful Ganeshas. Thanks for sharing these wonderful pictures. Pandal hopping during festive time is a bliss to see so much creativity on display! Thanks Arti! Thank you for letting me take part in your beautiful and Holy celebration. Arti: May you enjoy peace, happiness and gratitude today and all the days of your life. Thanks for taking all of us into the pandal hopping along with you..
M smiling for correcting my error silently..thanks a lot..after i posted i realized it..
beautiful pictures I so want to do that pandal hop for sure .. This ganesh chathurthi I was busy shifting my residence and missed all the fun. 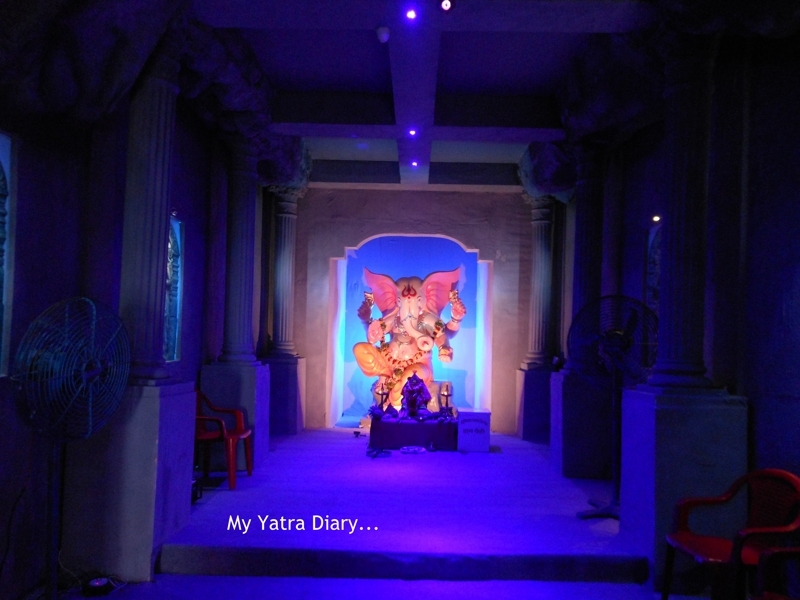 Liked the virtual tour of Ganesha pandal. Beautiful pictures and so colourful. And such words of wisdom from your mom. Ahhh.... one day I shall visit India and see all this with my very own eyes! Wonderful pictures, I want to learn more! @Arti Just come to your blog and saw your new post. Thank you so much for sharing awesome photos & post. I so love the wisdom shared by your mom Arti, so true, and so glad to meet all your Ganeshas, may all the obstacles in your way have been removed, and with wisdom, indeed, you have the strength to overcome those obstacles. wonderful, Arti!!! i missed out seeing a lot of ganeshas this year.. making up seeing ur blog! Hi Arti, these are great photos, and the colors are so festive! Beautiful pictures with few but lovely words of commentary to go with. china ho ya korea ... ganpati bappa moryaaaa !!!! beautiful pics and the post! thanks for the visual delight i had and for making me see Mumbai's Ganesh chaturthi festivities..! Your words have recreated the magic for us Arti. Lovely! Do you know in Chennai they started making innovative Ganesha idols like one playing cricket or sitting in front of a pc :) Is it the same in Mumbai? Amazing array of ganapatis. The songs, the prasad and the festivities make it so wonderful. You caught it all perfectly. what a moving post. I really like your mom Arti. That you were impacted deeply by this experience is evident in your words. beautiful. happy day to you Arti. thanks for sharing this. Pandal hopping sounds like such an interesting thing to do during the season. It must be so much fun to go around and see how each one is done, right? I'm so glad you get to do this and we get to see this through you. I could almost hear the chants and smell the incense. The words of your mother are great and full of wisdom. 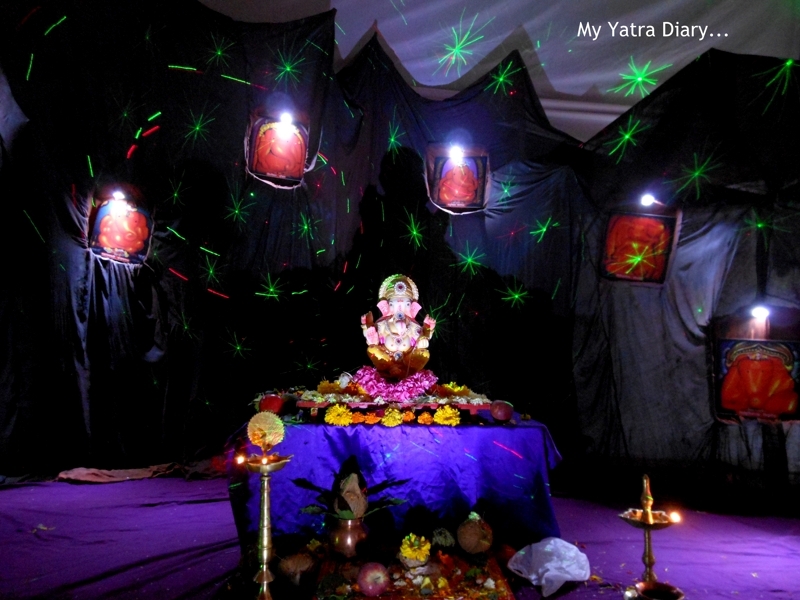 In flickering candle light, people exchange heart to heart talk with Ganesha. How peaceful and magical the pandals are! Ganesha has so merciful eyes. Thank you, Arti, for taking us along pandal hopping with you. Ganeshas are so colorful and fascinating. I don’t seem to have enough knowledge and wisdom because I still have worries.... though they are small. Wish you happy days ahead.